Me and my little guy hit up Pastrick Saturday morning. Was in the water around 9am. Ran 5 boards (firetiger body baits and brads,1 orange dodger and peanut fly) and 1 downrigger with a Northern King spoon in a pattern they don't sell any longer. We did the usual, ran the wall and did a couple loops between the hole and the 2nd light. We eventually trolled out past the 2nd light. I had the rigger down at 35' hoping to get my son on a lake trout. Here's where it gets interesting. We mark a lone fish on the bottom, I tell my son, we marked a big fish right at the depth of the downrigger. I tell him to watch the rigger rod, and start telling the rigger rod to pop..."pop baby pop...pop baby pop"...wham!! Rigger rod goes off, he grabs the rod. The fish starts ripping off drag, he's only 10 and yells holy "$HiT Dad!!"... He's never had a real big fish on before. He continues to play for fish for about 5 minutes, back and forth, to the boat, I see it and yell "It"s a KING!!". He doesn't know the difference yet between a laker and a king, he just knew it was a big fish that's putting up one heck of a fight. He get's it up after about 10 different runs and into the net it slides. Big King, weighed in at 17.5lbs. 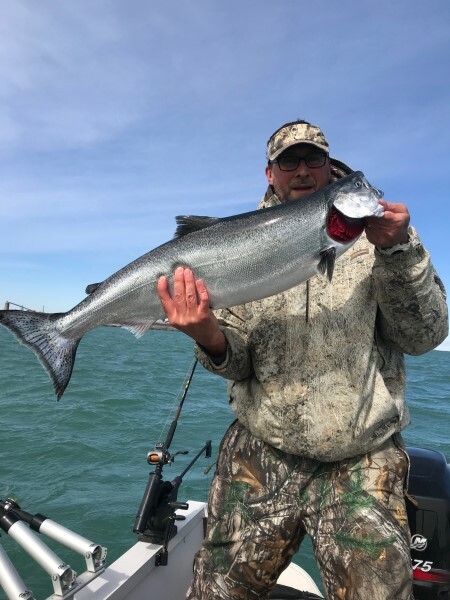 We caught 5 other coho's on dodger/black & purple peanut fly, firetiger shad rap (has been an absolute coho killer this year), another coho on the rigger spoon and another coho on an orange kwickfish (also been killing the coho this year). Definitely one of the best trips in the past few years. Hopefully a memory my son will never forget. That Son of your's will never forget that trip! 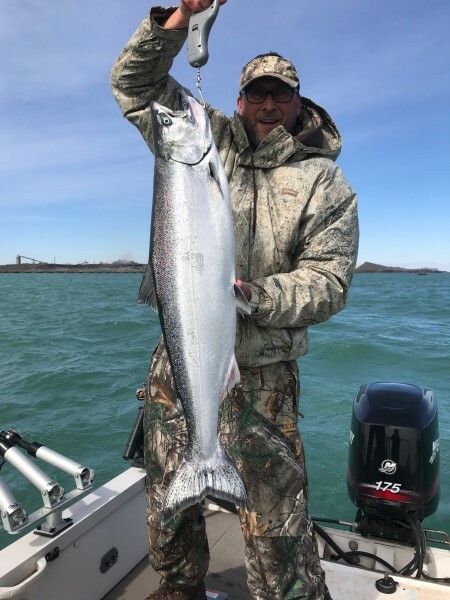 Very nice early season king! Life is to short. Enjoy fishing while you can! I couldn’t have asked for a better article to read than this on lunch break. Congrats on that trip! Nice job young man! Dad too! I know and have the exact spoon, oldie but goodie! NOW DATS A FISH!!!! Great job Team TBONE! Thanks for the report makes me want to put a snow plow on my boat, since we got a good 8"of snow yesterday. Thanks again. Nice job and good to put a name to the face, I am the guy that came up to the cleaning station asking questions while you were cleaning fish with the two other gentleman . Once again, great job. Something how a color can be hot for one and not for another. I hope you didn't mind the questions but this is my first year out there and appreciated all the help. Take care ,hope to see you out there again. Ah good to meet you, always happy to help another chitowner. Good to see that you are getting out on the lake with your boy. Bet he will remember this trip for some time. Miss you up north. Hey Mike, great to hear from you. Ya my time on the lake is limited. Usually only get a trip or two in early spring then end up taking the boat to Michigan for the rest of the season. Great story! 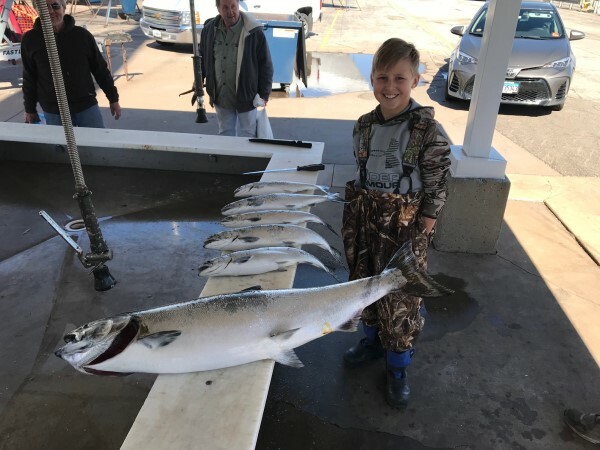 Very nicely done, awesome day on the water for you and your son ! 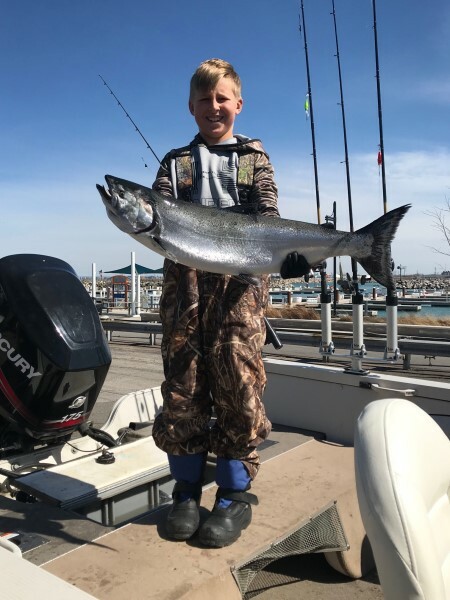 Good looking boy and what a fishing report and fish story. What would we do without the sport of fishing. My memories with 7 kids and their families and friends have made my life full. Soon going out in my sons boat, probably Pastricks. Still making memories. Thanks. Chitown-Angler was started on February 10, 2003 and has received 207589669 page views in total since that date.